Louis needed a basket to snuggle in. His people mentioned something about it rather inadvertently (I thought I heard the word “cat”, or maybe it was “bat”? And there was something about “basket”, but it might have been “brisket”, I’m not sure). At any rate, when I offered to make Louis a basket of his very own, they didn’t object. Well, not very insistently. I knew of course they were only being polite so as not to trouble me and so I assured them I’d be delighted to make it. I asked them what color they wanted it to be (I am so very careful not to impose my designs on my friends’ décor). They said maybe dark red. Fortunately I had some, and I thought it would go well with the gray. 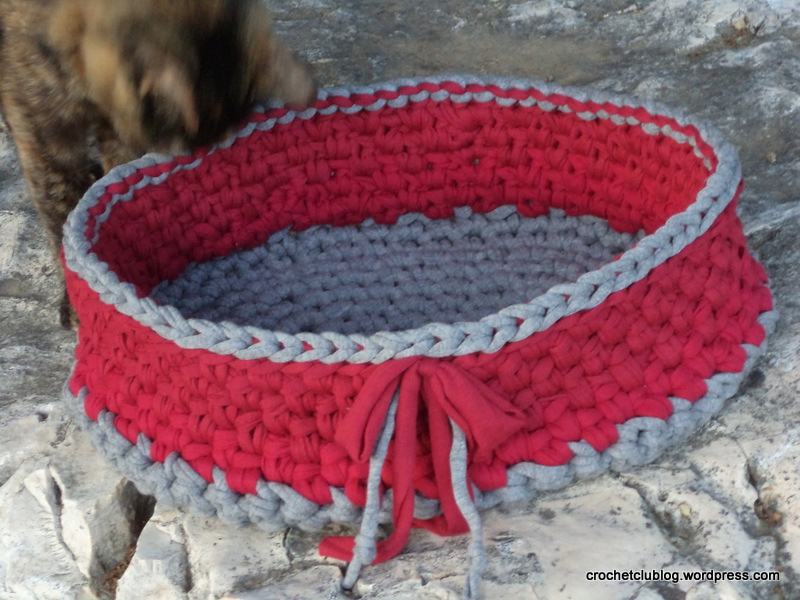 Louis’s people liked the basket, and I hope Louis will too (Right now it’s high summer so Louis spends most of his time outside, stalking frogs and such). 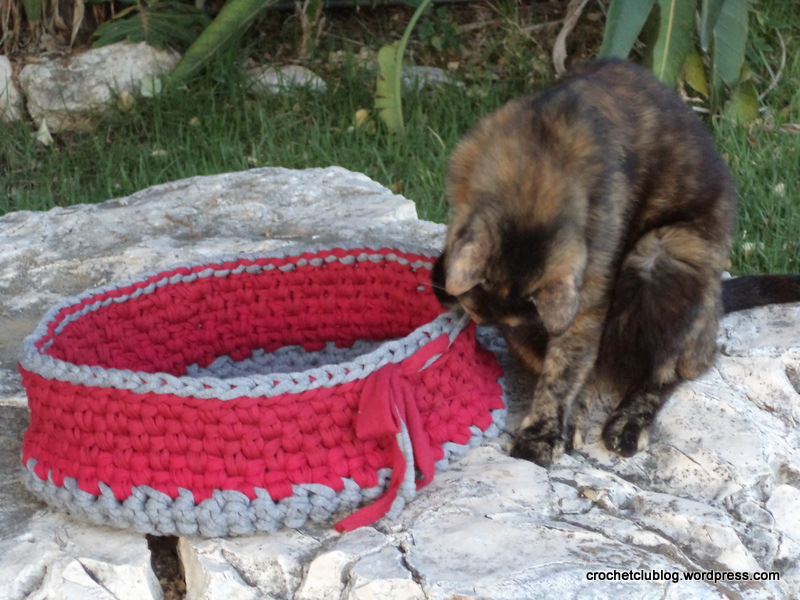 If you want to know how I made the basket, please scroll down. The cat in the pictures is not Louis, but our cat, who always joins me whenever I’m taking pictures of my projects in the garden. In this case she seemed especially interested, and in the end I could see why. I had to re-tie the bow a few times but now it’s back to it’s original elegant form. How I made the basket: I asked Louis’s people what size they thought it should be. They measured the newspaper basket he usually settles in and said, 30cm X 40cm. Since I wanted to make an oval, I subtracted the width from the length (40 – 30 = 10) and that gives you the length of the starting chain. Make a starting chain of 10cm (I used a size 12 hook), ch 1, then sc into the 2nd st next to the one on on your hook, and into every one after but the last. When you reach the end stitch, make 3 sc into it. Continue with sc into each st on the other side. When you reach the end stitch, sc 2 into it, which will join the one sc you made at the start. Continue with sc in a spiral, always adding 3 sc on the round part of each side every time you crochet along it, the same way you pick up your salary whenever you pass ‘start’ in Monopoly. When your width is 30 cm, your length should be 40 cm. Stop adding, and make a row of 1 sc all around. Finish it off with an invisible join and cut. Start a new thread for the next row (mine was red), crocheting with woven stitch around the base (crochet from the outside, with the right side of the base facing upwards), and close the row with 1 sl st and 1 ch st. Continue upwards with woven stitch, closing each row with sl st and 1 ch st. Notice you are no longer crocheting in the spiral but closing with a sl st and ch 1’ing at the end of each row. When you reach the desired height, finish off the last row with an invisible join and cut. Make the trim using sl st into back loops only of top row of sides, finishing off with an invisible join. Leave a tail at the beginning and end of the trim (mine was gray as you can see). Draw the tails outside, and cut a separate piece of red strand. Try and simulate tying a bow before it’s cut so you know how long to cut it. 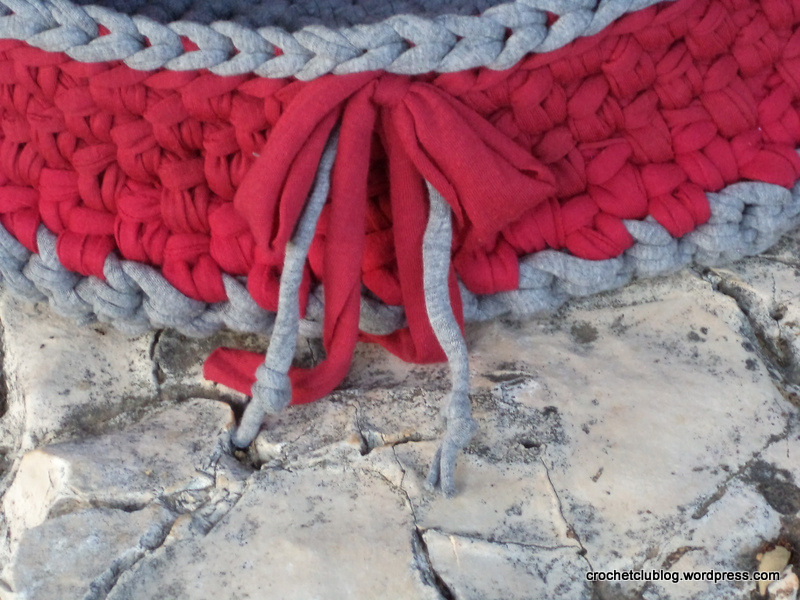 Now place the cut strand on the inside of the basket where the gray tails were, draw out the tails of the red strand, and tie a pretty bow on the outside. Snip the ends to match the length of the gray tails. I tied a single knot at the ends of the gray tails because it made them hang down a little better, so if you want to do that, tie first before matching the length of the red. 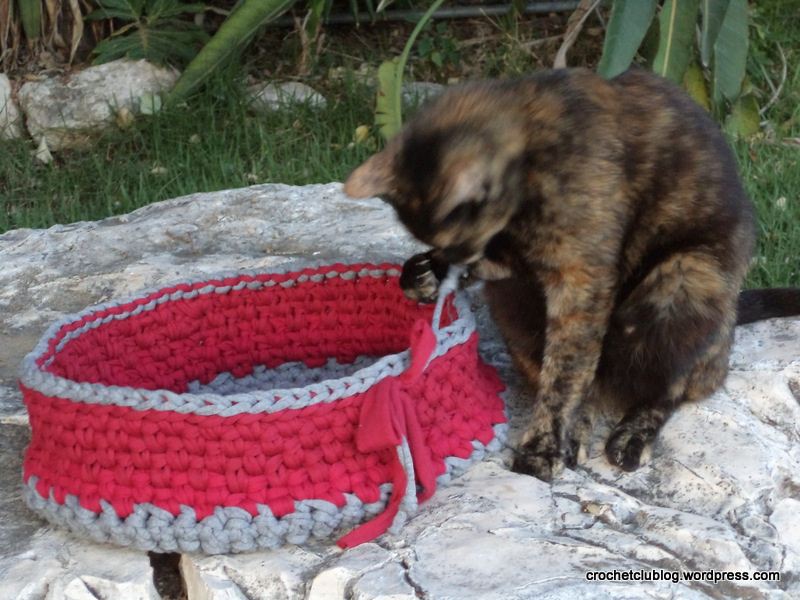 This entry was posted in Projects and tagged basket, cat, cat bed, crochet, DIY, fabric yarn, oval basket, oval crochet, t-shirt yarn, tarn, trapillo, woven stitch, Zpagetti, סריגה בטריקו on July 3, 2015 by The Basket Fairy.